So, he finally went and did it. Old Wade not only made the crossover into his own feature film franchise, but he’s also leapt into the world of the literary novel with a little help from author, and vessel through which his spirt is channelled from the Marvel Universe (which at one point Deadpool killed everyone, well everyone of not anyway, in, but that’s another story) to the printed page, Stefan Petrucha. 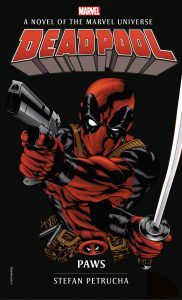 PAWS finds Deadpool employed (albeit on a freelance basis though, as no respectable law enforcement agency would give a psychotic, homicide happy lunatic a “proper” job right? of course they wouldn’t) by S.H.I.E.L.D., to seek, locate and destroy puppies. Yeah, that’s right; puppies. But before you start panicking and writing to PETA, the RSPCA and your Member of Parliament about that dreadful Deadpool and the awful things he’s doing to young canines at the behest of the “government”, you need to calm down, swallow a fistful of Valium and stop worrying, because these puppies aren’t the normal, fluffy, cute, playful type. Oh no, these puppies are really genetically modified killing machines disguised as everyone’s favourite pets in an attempt to infiltrate society before transforming into their true selves and destroying everything, and eating everyone, within a ten mile radius. These are bad doggies and it’s Wade’s job to stop them; to find out who created them and why, and bring the whole insane science project to an end. However, as with all things involving Deadpool, it doesn’t go exactly to plan. And while most of it works out in the end (and that’s not a spoiler, as hey it’s a superhero story and they always close on a happy ending. Usually. Sometimes. Uh, would you believe every now and then? You would? Good), it does so in the usual crazy, balls out, mayhem filled and action packed manner that we’ve come to expect from Wade Wilson.